Allison Kosins, an 18-year-old from Warsaw, Indiana, had the opportunity to meet a member of Canadian Brass on Saturday, Sept. 16 when the quintet ensemble returned to perform at Goshen College as part of the 20th Anniversary Performing Arts Series. Kosins is a musician in her own right, playing the French horn in her school band and church orchestra. Kosins also has been diagnosed with aplastic Leukemia. Later this fall, Kosins is scheduled to undergo a bone marrow transplant procedure. Through the Indiana Child’s Wish Foundation Alison was granted a French horn of her own, which she received earlier Saturday evening at the Music Center along with a private lesson from Canadian Brass’ French horn player, Bernhard Scully. 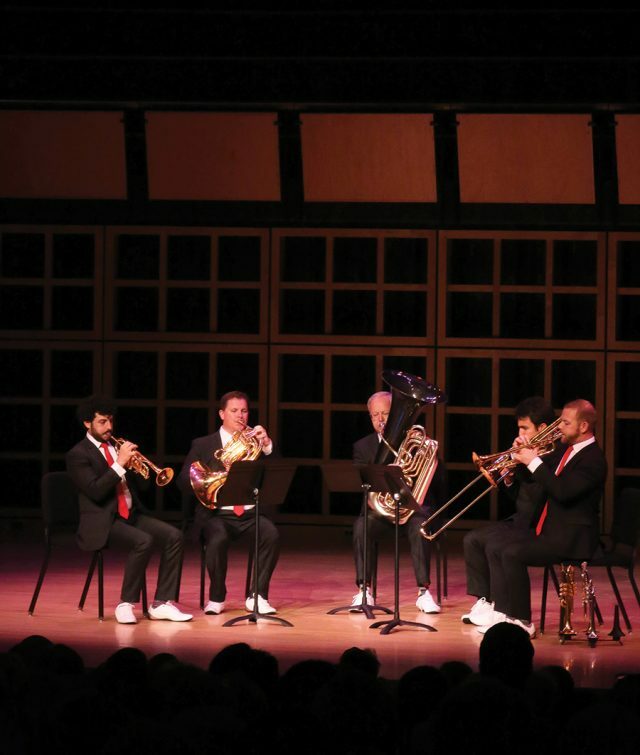 Canadian Brass, currently in their 47th season, is a classical brass quintet and a three-time Grammy Award-winning ensemble consisting of founder Chuck Dallenbach on tuba, Caleb Hudson and Christopher Colletti on trumpets, Achillles Liarmakopoulos on trombone, and Bernhard Scully on French horn. They have played in concert halls throughout the US, Canada, Japan and Europe, and have been featured on over 137 audio recordings and videos. Even so, Saturday evening was Burkholder’s first time seeing the brass ensemble in concert. “I found them to be humorous and impressive,” he said. The next concert in the Performing Arts Series is Mary Chapin Carpenter on Saturday, Sept. 14 at Sauder Hall.